The Italians aren't the only pasta-lovers. The German answer to pasta is Spätzle. Spätzle are loved in Germany and are part of its identity and cooking-culture. 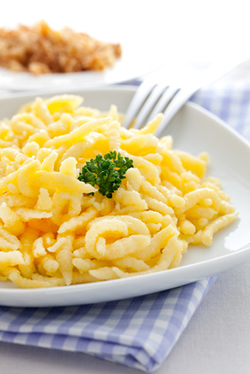 Although Spätzle are served and enjoyed throughout Germany, they are considered a specialty of the Swabian (Schwaben) region. • The classic way to form Spätzle is to spread the dough over a wet wooden cutting-board. Cut thin strips of dough with a knife, then scrape the strips into boiling salt water. • A Spätzle-Press can be used. This device looks like a large garlic press. It presses the dough through wholes, forming the dough into long strips. This is done directly over the cooking pot so the dough strips fall into the boiling salt water. • A Spätzle-Sieb can be used. This device looks like a flat colander. The dough is pressed through wholes, forming the dough into long strips. Just like with the Spätzle-Press, this device is used directly over the cooking pot so the dough strips fall into the boiling salt water. • A Spätzle-Hobel (Slicer) can be used. This device looks like a vertical cheese grater, topped with a square "sleigh" that slides side-to-side. As the sleigh slides side-to-side, it presses the dough through wholes. The formed Spätzle strips are boiled in salt water, just long enough for them to rise to the top of the pot. The Spätzle should be removed from the water and served immediately. The first evidence of Spätzle dates back to 1725. It is believed that they must be much older than this, but it is not known when and how Spätzle were invented. However, evidence shows that Spätzle used to be formed by hand or with a spoon into small pieces of dough. This version resembled a sparrow (Spatz) which is why they were called Spatzen. 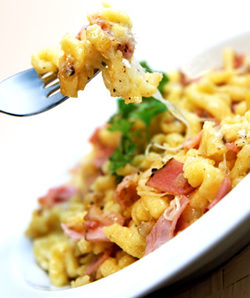 Another theory states that the word Spätzle originated from the Italian word "spezzato" meaning "small pieces." It was the Swabian people that "german-ized" the word calling the noodle Spätzle. 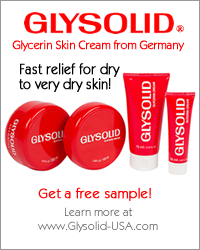 • In Bavaria, the Spätzle dough is made with beer instead of water. • Spätzle left-overs taste just as good the second day. Simply heat them in the microwave or in a frying pan with a little melted butter. • The thicker, drier the dough, the tougher the cooked Spätzle turn out. • To achieve a softer texture, use mineral (carbonated) water instead of still water when making the dough. • Add a tablespoon olive oil to the boiling water (where the Spätzle are to be cooked in) to prevent the Spätzle from sticking together. • If forming the Spätzle the using the "classic method" of scraping the Spätzle from a cutting board, dunk the cutting board in the boiling salt water to prevent the dough from sticking to the board. • Spätzle can be cooked then frozen for later consumption.